Aquaphotomics provided significant contribution to the field of microbiology by providing fast and nondestructive analysis (Slavchev et al. 2015, Remagni et al. 2013, Nakakimura et al. 2012, Slavchev et al. 2017). The example of such application was in growth monitoring of three different groups of bacteria strains: probiotic, non-probiotic and moderate (Slavchev et al. 2015). 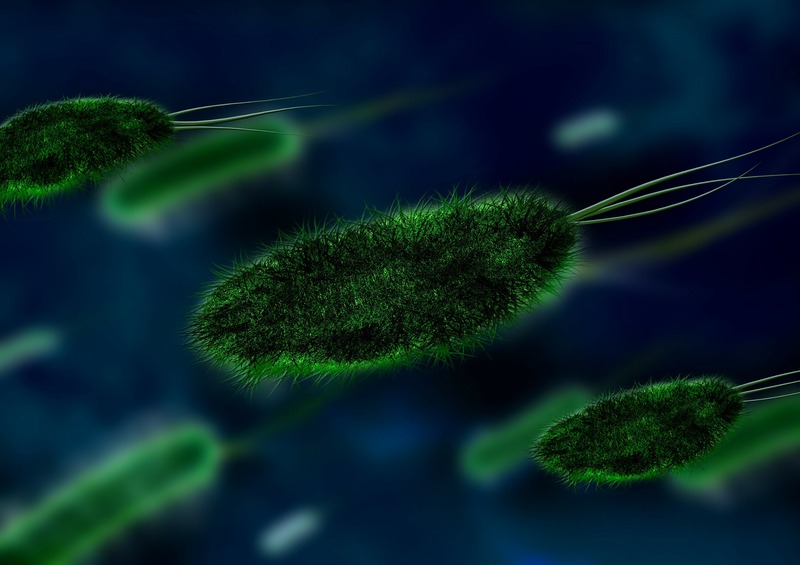 The results showed high accuracy of bacteria strains classification according to their probiotic strength, while most informative absorbance bands were found to be in the first overtone of water suggesting importance of water molecular system to the overall cell functionality. Comparing the groups based on their water spectral patterns, probiotic bacteria strains were found to be characterized by higher number of small protonated water clusters, free water molecules and water clusters with weak hydrogen bonds (Slavchev et al. 2015). This work improved understanding of the roles of specific water molecular species for living processes – it has been discovered that strong probiotic bacteria have high number of less hydrogen bonded water species which may help better understanding of their beneficial health effects. Similar study determined that aquaphotomics approach allows successful, rapid selection of probiotic bacteria strains even in the water first overtone of combination vibrations range (1100–1300 nm) (Slavchev et al. 2017). The differences in water spectral pattern of different bacteria strains was shown to be a result of differences in extracellular metabolites which leave different imprint on water structure (Nakakimura et al. 2012). Nakakimura, Y., M. Vassileva, T. Stoyanchev, K. Nakai, R. Osawa, J. Kawano, and R. Tsenkova. 2012. “Extracellular metabolites play a dominant role in near-infrared spectroscopic quantification of bacteria at food-safety level concentrations.” Analytical Methods 4 (5):1389-1394. Remagni, M.C., H. Morita, H. Koshiba, T.M.P. Cattaneo, and R. Tsenkova. 2013. “Near infrared spectroscopy and aquaphotomics as tools for bacteria classification.” NIR2013 Proceedings: Picking Up Good Vibrations:602. Slavchev, A., Z. Kovacs, H. Koshiba, G. Bazar, B. Pollner, A. Krastanov, and R. Tsenkova. 2017. “Monitoring of water spectral patterns of lactobacilli development as a tool for rapid selection of probiotic candidates.” Journal of Near Infrared Spectroscopy:0967033517741133. Slavchev, A., Z. Kovacs, H. Koshiba, A. Nagai, G. Bázár, A. Krastanov, Y. Kubota, and R. Tsenkova. 2015. “Monitoring of water spectral pattern reveals differences in probiotics growth when used for rapid bacteria selection.” PloS one 10 (7):e0130698.